Miranda here, posting a recipe by request. So here’s the deal. Eggplants are creepy. Don’t get me wrong, I think they is one fine looking piece of … fruit? vegetable? alien pod? whatever. And so much variety in shape, size, colour, etc., that the eggplant area of my life is delightfully well-spiced (you know, ‘variety is the spice of life‘…. Okay). I dig it. But … they also seem kinda poisonous, and like, what’s up with being the texture of wet packing foam fresh and like the lovechild of a mushroom and a whelk when cooked? I see you decided to go with ‘slippery’. Well played Mme. Aubergine, well played. It’s taken me a long time, an exercise of my palatal boundaries (aging, as Shakespeare noted, does play dickey with our tastes), and an interest in slaking my mother’s insane hunger for eggplant to reach parley with this ‘edible’. I’ve disCOVered … it’s quite nice. Mixed with other stuff. Cooked like, a lot, usually with spices. Hey, does everybody want a bouquet of only baby’s breath? No. I like my textures diverse, and my baba ganoush like, 90% pita chip. 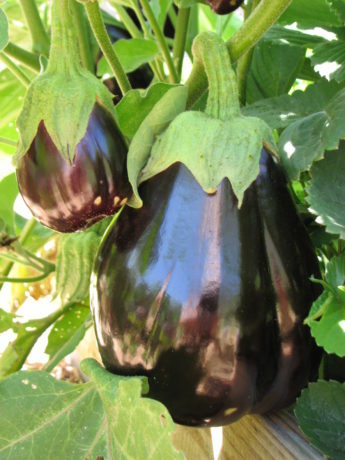 To get to the point, I composed this delish eggplant recipe with reference to Almost Turkish Recipes’ Vegeterian Eggplant Stew (Etsiz Patlican Güveç) and Taste.com’s Beef and Eggplant Stew and a hearty helping of rugged individualism. It came out preh-tay awesome, I am required by inherent truthfulness to say. Diane loves it for its rich layers of flavour and healthy, hearty vegetabliness that make it the perfect combination of comforting and exotic. There’s something for everyone in there! Plus, you can stroke some more hash marks into your summer “Zucchinis/Eggplants/Tomatoes ENDED” tally with a sauce-stained smile once you’ve roused yourself from your stewy food-coma. The perfect combination of comforting and exotic, and an amazing way to use up summer vegetables. 1 tbsp. thick tomato product: tomato paste, fresh tomato concoction, specialty ketchup, etc. 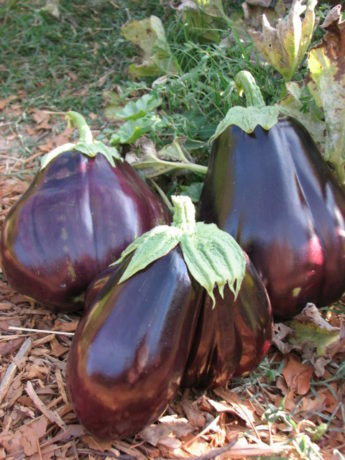 Use vegetable peeler to stripe the eggplant and zucchini lengthwise. Chop into ~ 1 in. pieces, or to preference (eggplant will shrink in cooking, so can leave larger chunks). Chop potatoes smaller (1/2") to keep cooking time down. Heat a large pan (I prefer to use our flat-bottomed wok) on high until very hot. Toss in eggplant and zucchini as well as potatoes and seitan and allow to sear, stirring on and off to prevent burning. Drizzle some sesame oil and/or olive oil around the edges of the pan to stop the searing and allow the veggies and seitan to begin to fry. When seitan begins to brown a bit, turn down the heat and add the onion and garlic. Cook, stirring, until onions are browning (don't allow garlic to burn, as it cooks faster than onion). Add spices and ketchup, and stir on medium-low for a few moments to fully incorporate. Pour in broth and stir well. Cover, and set to simmer for 30 min. If it's looking too soupy towards the end, remove the cover and raise the heat until it's less liquidy, but it should be like a thick stew. We count on the excellent leftovers, so I always make extra, but it is filling so portion size may be smaller for some. May also be made a few hours early, left in the pan on the stove and reheated to serve. For seitan recipe see Diane's post: http://www.vegetariat.com/2015/01/seitan/.